It can be very useful to have a read-out of chuck speed on drill presses, lathes and mills that have variable speeds. 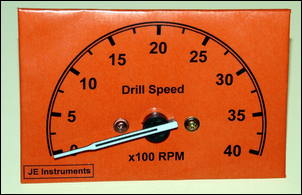 That’s especially the case if you use a stepless electronic speed controller, but even if altering speeds involves swapping gears or pulleys, it’s still good to have a display showing the tool’s actual, loaded, rotational speed. In fact, wouldn’t it be good if you could have a big dial displaying revs per minute? Hmm, cars have one of those… it’s called a tachometer. And all modern tachos just use a simple pulse input… I think we have something here! 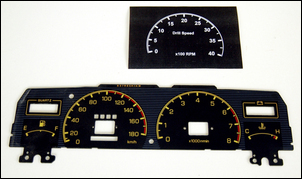 To make this speed display you’ll need a tacho from a car. As when sourcing many secondhand parts, you don’t want to go along to a wrecking yard and ask for the tacho from a specific model – not unless you want to pay top dollar, anyway. Nope, what you want is an orphan – for example, the whole dash display discarded because the faceplate is scratched. In addition to the tachometer, you’ll also need a ~12V plugpack, a reed switch (from an old speedo or new from an electronics shop), a small magnet, a 10 kilo-ohm trimpot, a ~30 kilo-ohm resistor, a 1000uF capacitor, and a box to mount it all in. To make a new scale you’ll need a PC, scanner and printer. 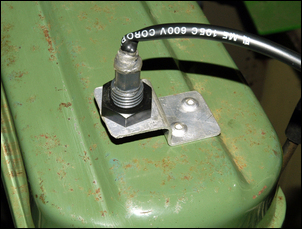 A reed switch is automatically closed by the passing of a magnet mounted on the driven pulley. 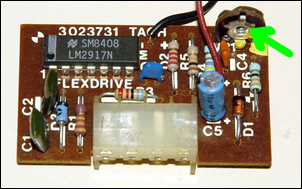 The reed switch is fed 5V that’s derived from the 10 kilo-ohm pot across the 12V supply. Therefore, when the reed switch closes, 5V is fed to the tacho frequency input. When the reed switch is open, the tacho input is pulled to ground by the 30k resistor. On the right-hand side, the tacho electronics drives the needle of the tacho. 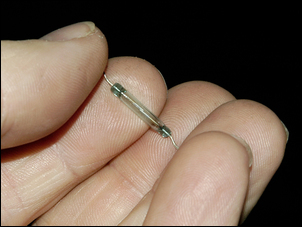 A new capacitor (shown here as being 1000uF) smooths the movement of the needle at low speeds. As calibrated from the factory, it’s likely that the speed range will be too high for the new application – there aren’t many cases where you want the lathe or drill press doing 8000 rpm! This means two things: firstly, the frequency input range of the tacho will need to be altered; and secondly, a new scale will need to be made for the meter. In the case of the tacho shown here, the on-board pot gave plenty of adjustment. In fact, with one input pulse per revolution of the drill-press, even at the slowest drill press speed the needle could be adjusted for full scale deflection. However, we’re getting ahead of ourselves. 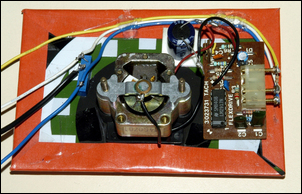 The tacho should have three connections - +12V, ground and the frequency input. If you buy the tacho with the whole instrument panel intact (the best approach), look very closely at the tracks on the flexible PCB on the back of the panel. In many cases, +12V and ground (earth) will be marked, leaving only the third pin - which must then be a frequency input. If the PCB is not marked, you may need to seek the help of an automotive instrument repairer to get the pin-outs right. Then mount the reed switch so that the magnet passes close by it on each rotation of the shaft. Most reed switches are small bare glass tubes, but the one we used was salvaged from a float switch so came in a housing. Incidentally, the glass ones break easily so don’t bend the leads close to the body, and handle the switches with care. Once the magnet is installed, wire up the rest of the circuit as shown in the wiring diagram above. The pot should be adjusted to provide a nominal 5V to the reed switch (measure this with a multimeter) and don’t forget to install the pull-down resistor. 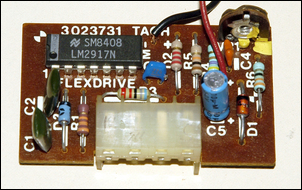 The capacitor across the meter’s drive damps the jerky movement that occurs when the input frequency is lower than it would normally be in a car. Note the polarity of the cap – you can work out the meter’s polarity by disconnecting it from its drive circuit and applying a low voltage (eg 1V) to its leads. When it’s connected so that the needle moves in the right direction, take note of the polarity of the supply. Once you’ve wired up the circuit, start the machine tool and make sure you get at least some needle deflection on the tacho. If you don’t get any, experiment with the value of the pull-down resistor. This is easily done if you use a 10K pot wired as a variable resistor and adjust it up and down. If there’s still no joy, try increasing the voltage going to the reed switch. Finally, if you still get no needle movement, add a second magnet directly opposite the first so that there are more pulses per revolution. Once the needle is registering something, run the machine at its fastest speed and try adjusting the on-board pot to get full scale deflection. If you can’t get there with the built-in adjustment, add more magnets to the shaft. If you know the fastest and slowest speed of the machine, you can calibrate the scale to those revs – everything in between will then look after itself. Use your PC and printer to make a new scale. Scan in the original car tacho scale and use image manipulation software to alter the numbers and delete other markings you don’t want. Of course, at this stage you can also add whatever labels are suitable. Print it out at full size and then it’s just a case of sticking it over the original. We used clear ‘contact’ adhesive film to protect the paper scale. You can use a frequency measuring multimeter to measure the speed of the tool. The meter will measure in Hertz (cycles per second), so to gain the tool speed in rpm, multiply by 60. 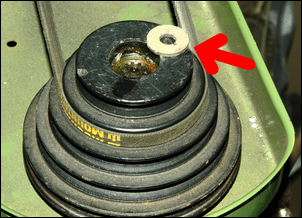 (That assumes you have just the one magnet on the output pulley.) If the meter jumps around a lot, try temporarily adding small value capacitors in parallel with the reed switch to damp the bounce that occurs when the switch closes. If you have a scope, it’s ideal for reading the frequency.